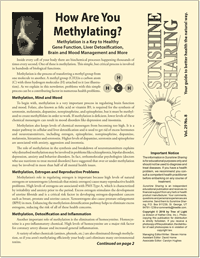 This issue of covers how methylation is a key to healthy gene function, liver detoxification, brain and mood management and what you can do to determine whether your over-methylating or under-methylating and how to correct methylation problems naturally. It also includes information on the many uses of SAM-e.
Modern research suggests that most chronic and degenerative disease begin with chronic inflammation. So, if you want to prevent these diseases, or reverse them once they have started, you have to know how to overcome chronic inflammation. 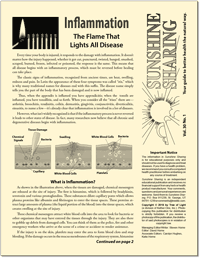 This issue of Sunshine Sharing covers the importance of understanding inflammation and how to reverse chronic inflammation to both stay healthy and to recover from nearly all chronic and degenerative diseases. 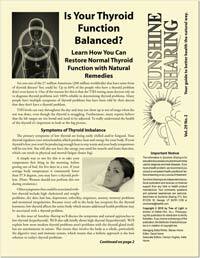 Is Your Thyroid Function Balanced? 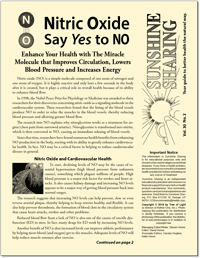 This issue of Sunshine Sharing covers the symptoms and natural approaches to low thyroid (hypothyroid) and high thyroid (hyperthyroid). With an estimated 200 million people suffering from some sort of thyroid problem worldwide this is an important topic to learn about. In this issue learn about thyroid hormones, what to do if the thyroid problem is autoimmune related or not, allergens to avoid, the importance of the intestinal system, the importance of relaxation and herbs and supplements can be used to balance the thyroid. 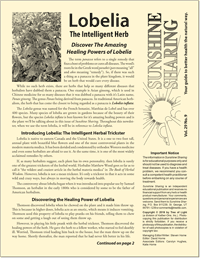 Discover the amazing healing powers of lobelia in this issue of Sunshine Sharing. Lobelia is a highly acclaimed and useful herb. Depending on how it is taken it can be used as a relaxing respiratory remedy, a powerful pain reliever, an aid to stop smoking an herb to support the heart and circulatory system, a powerful emetic among other valuable uses. 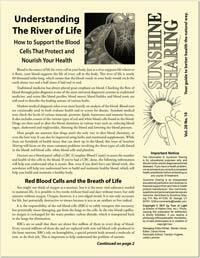 In this issue of Sunshine Sharing learn how to relieve pain, heal old injuries, reverse chronic disease and keep your immune system strong in this issue of Sunshine Sharing which covers the critical but often under appreciated lymphatic system. This system is responsible for draining lymph from the tissues, carrying away toxins, cellular debris and infectious organisms. Learn how lymphasizing, deep breathing, massage, rubbing, hydration and lymph moving herbs can all work together to make sure the lymphatic system is healthy and working smoothly. 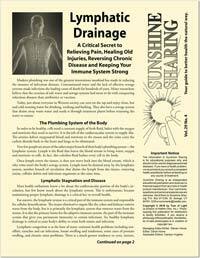 In this issue of Sunshine Sharing learn how both physical and emotional issues related to the spine and secrets to maintaining a healthy spine, one that is free from problems and pain. As well as information on posture, spasms, disk problems, nerves and recommends ways to avoid back problems and help to reverse them when they occur.